So recently, I posted up a picture on my Instagram of my Homemade Chia Seed with Almond Milk Pudding. A couple of you asked what the recipe was, so I am writing to you today to share. I love this homemade recipe because it’s not only so easy, but it is incredibly healthy. Chia seeds are among the healthiest foods on Earth! There are many benefits: they are filled with lots of nutrients with few calories, loaded with antioxidants, are very fibrous, and jam-packed with quality protein. Ready? Let’s Make It Happen! Combine almond milk, chia seeds, and sweeteners of your choice into a bowl or mason jar. Mix well until mixture starts to thicken. Store in refrigerator overnight – I like to store it for 12 hours, some people just want to store it for 1-8 hours. Before serving, stir around the seeds in the mixture. You should notice that the mixture is thicker and has a more gelatinous texture. Top with your favorite fruit and/or nuts. Please note that this recipe is for two servings. 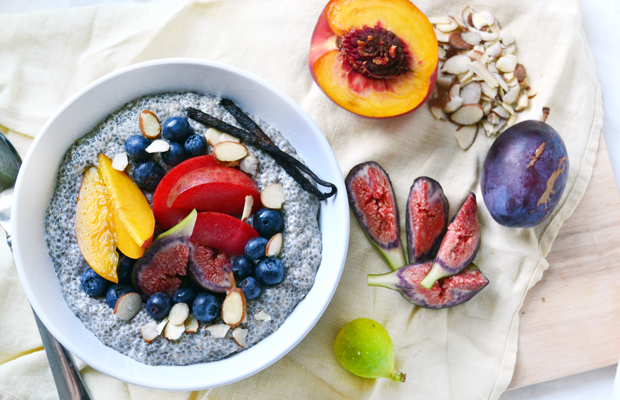 You can store the Chia Seed Pudding in your fridge for up to 5 days if you want an easy breakfast to-go. However, every day that the pudding is in the fridge, it thickens more, which I don’t particular prefer, but some people do.